Open Up is a unique programme for secondary schools and sixth forms run by Open House. Direct experience of contemporary architecture is the starting point for developing design skills and awareness of the built environment. 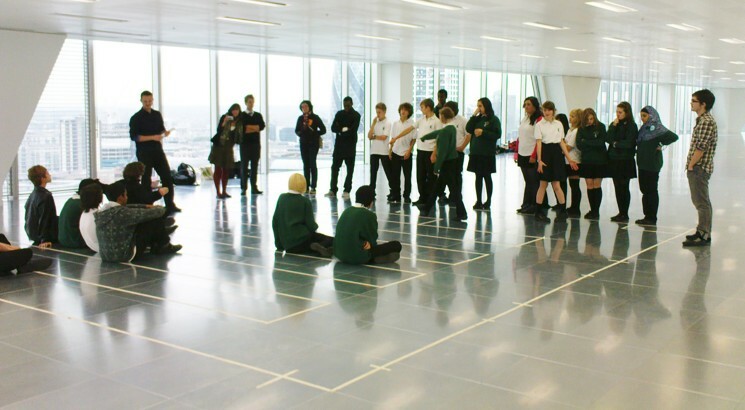 We lead an Open Up workshop in an empty office in The Broadgate Tower overlooking the city. We asked the students to mark out from memory their classroom on the floor using masking take, and then to inhabit the imaginary space. We discussed what was good and bad about their classroom and how they might propose to change it. We showed the students interesting material samples and encouraged them to ask questions about how and why these might be used. We also set them a task of adding a new building to the London skyline by drawing on tracing paper on the windows, and awarded a prize for the best idea. Back at the school we lead a creative workshop to design their own ideal temporary class rooms, complete with scale model of their teacher!